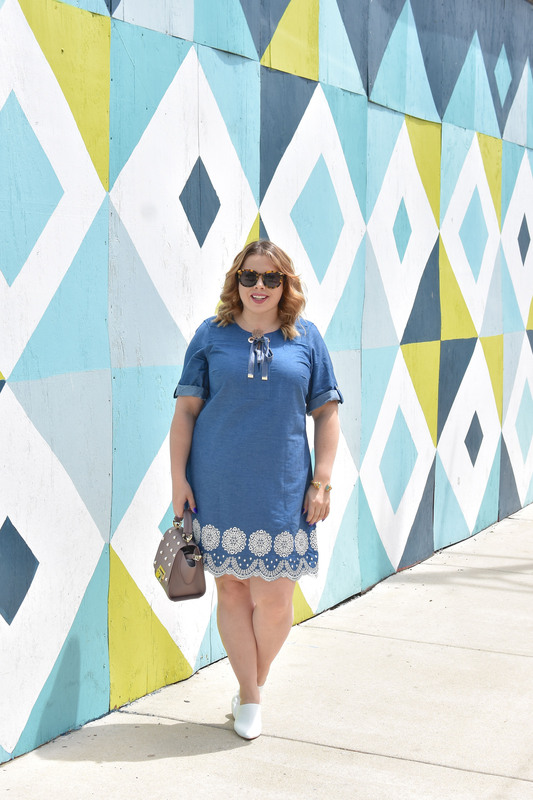 ** Thank you so much to Macy’s and Tommy Hilfiger Plus for sponsoring this post! Thank you for always supporting brands that support this blog! Hey all and happy Monday! Hope you all had such a fabulous weekend! It was finally consistently warmer in Chicago, and not raining and 40 degrees at night like it was last week! It has been so tough dressing for this crazy weather recently, and I have not been sure what to wear from day to night! Thankfully, the weather has warmed up a bit and I can get back to wearing dresses all the time! I have spoken about this consistently on my blog the past few years… and it definitely still holds true today! I have never been a big pants person, so dresses are really what a cling to as a plus size/ curvier woman. Now, there are way more options available in all types of clothing, but for a long time, there weren’t many options! I remember wearing Tommy Hilfiger as a kid and seeing people in their iconic polos and shorts! I always loved how classic their pieces were, and I am so happy that they carry a plus size line at Macy’s! I love a good print for spring, especially when a color is involved as well! I was so happy to see that Tommy Plus had some gorgeous prints, like the one on this maxi dress shown above. 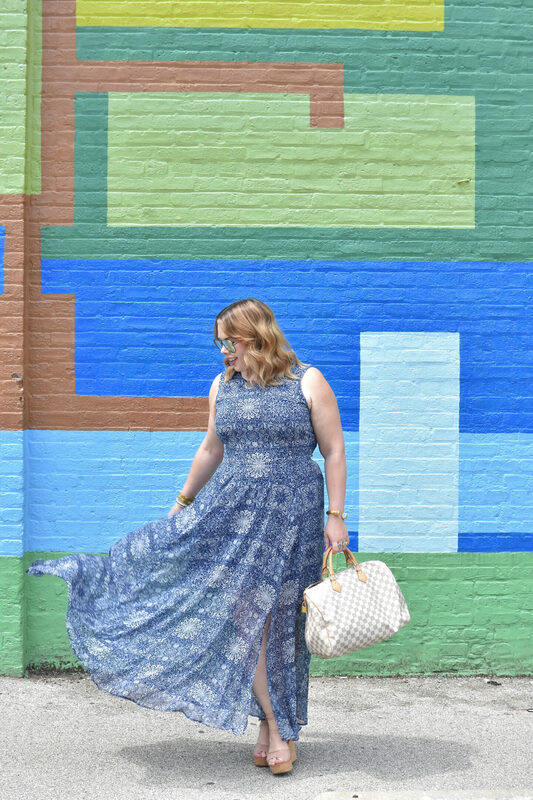 The length was perfect and it had slits on the sides, which made it a lot more flowy when walking… which is key to any maxi dress (you need that drama)! I also loved that this chambray dress had such a cute printed embroidered detailing on the bottom. 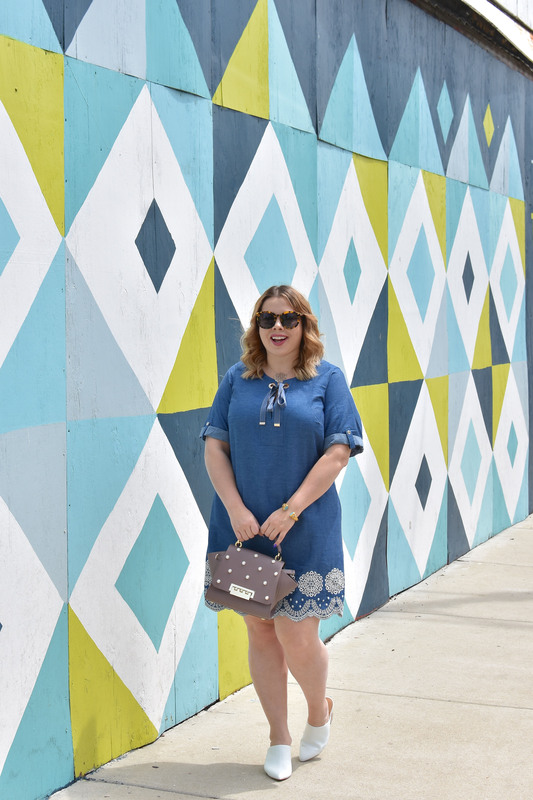 I really love a good pop of color or detailing on every outfit I wear, and this dress was no exception! The thing about being curvier, is you still run the risk of things not being true to size or not fitting so well. 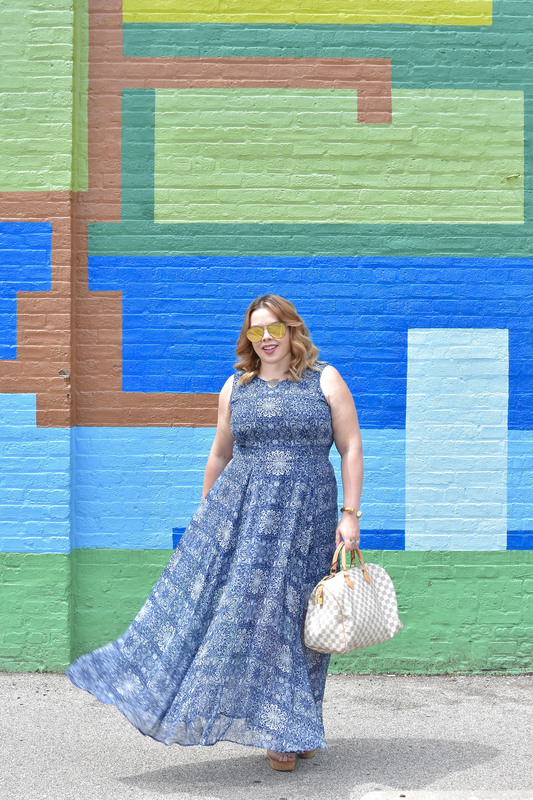 This maxi dress ran completely true to size and cinched in at the waist, which is so important to me! On longer dresses, having a cinched waist is an absolute must for me, or I end up look way heavier than I actually am! The last thing I need is more bulk added to me. 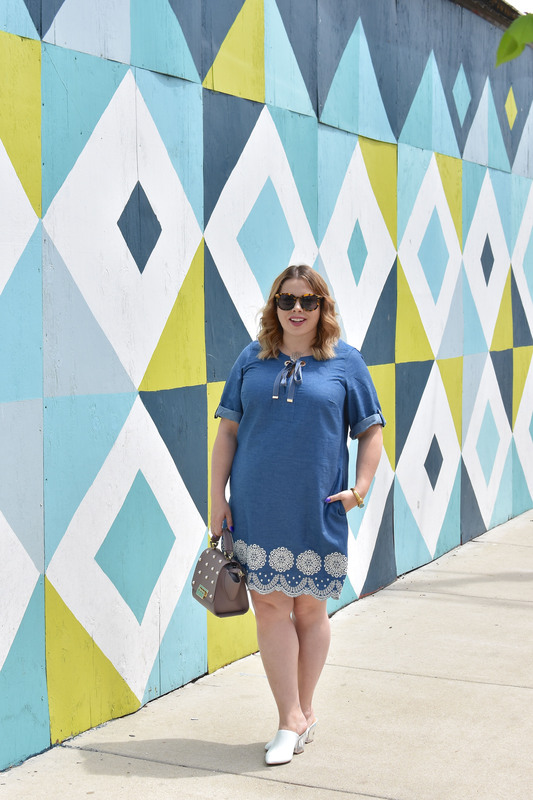 This chambray dress ran true to size as well, and was not too long… as I tend to look weird with something too long (I’m 5’3”)! Hope you all have a fabulous Monday and gorgeous week ahead! Feel free to check out the entire collection via Macy’s! These looks are my favorite EVER on you! I love those blues and the maxi is especially stunning. You chose the perfect pieces, that’s for sure! Summertime style at its finest! I am loving this maxi dress! I love dresses but it’s been so cold out that trying to wear appropriate clothes is hard. But that second dress is perfect for the warmer months! You are literally flawless. I love this dress. I love all that outfits! Looks good on you. I also love the background! So colorful! Thanks for sharing this. Oh these dresses are so beautiful! 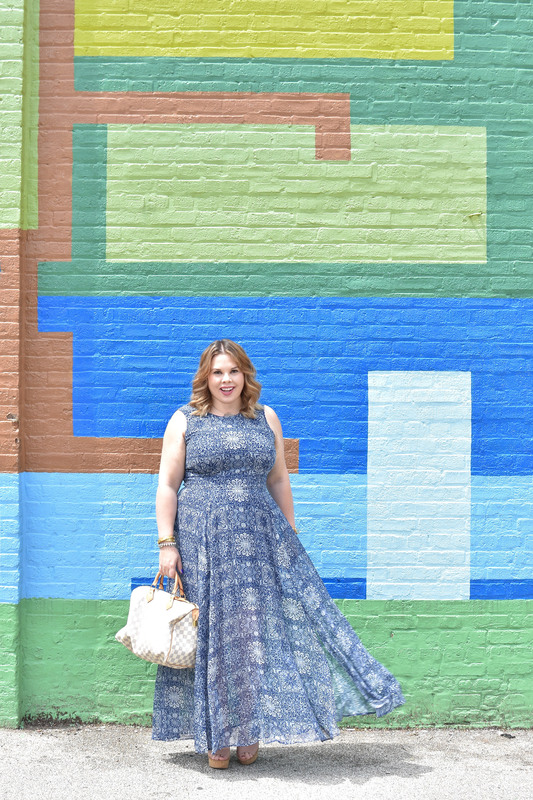 I love the maxi dress – the flowy movement is so pretty! These are super cute pieces! You look amazing in them! The blue in both is a really pretty color. What a gorgeous dress! It looks amazing on you and I love how you styled it! SO fun! These dresses are seriously so cute on you!! They’re so perfect for Spring and Summer! Beautiful dress babe! Perfect for Summer! These dresses look amazing on you – SO flattering. Blue is definitely your color!! I am so obsessed with that maxi dress! These pieces are stunning on you! I’m loving all the blue! I love that first dress in this post! Is it paisley print? This dress has the BEST movement and print. Love it! These dresses are gorgeous! I love how both look on you. These dresses are beautiful and you’re rocking both outfits! So perfect for summer! The print and denim dress are so gorgeous! I’m all about a good maxi dress. This one looks fabulous on you, I’m always looking for a new one! It’s so awesome to see how far Tommy’s has come with their trendy attire. I just love this dress. Though I love the maxi dress, the denim one is my fave! From the dresses to the background! Wow so beautiful. They are all so prefect on you. Both of these dresses look amazing on you, but I think I love the maxi on you the most! I love the fit on both of them and how they have fun prints! Perfect for summer.